According to the French historian Max Gallo, "for over two hundred years, posters have been displayed in public places all over the world. Visually striking, they have been designed to attract the attention of passers-by, making us aware of a political viewpoint, enticing us to attend specific events, or encouraging us to purchase a particular product or service." A poster, primarily is only a piece of printed paper designed to be attached to a wall or vertical surface. A couple of decades ago, posters were the best source of reaching the masses. Most Fridays, new cinemas would be released and whole of Tamilnadu would see double-sized posters of the new release, attracting more people to the theatres. Slowly the culture permeated so deep that there were posters hailing 100th day – degenerated to 25 days and even successful opening. There were some hailing the audio release and pooja of proposed films even. Posters are the most preferred form of advertisement for political parties too – in some places, even death would be communicated through posters. You would have seen posters of Temple festivals, of political agendas, cinemas, hailing regional and caste leaders, announcing the death of near and more… – have you ever seen posters pertaining to education or ones hailing the performance of students ? We live by the axiom that ‘Education is the only tool which can uplift the Society and empower the lower echelons of the Society’. The foremost responsibility of a Social Service Organisation is to improve the society and help the underprivileged. From smaller experimentations to full-fledged quality educational assistance in the form of SYMA Growth was born on 6th July 2008, a very auspicious day, inaugurated at NKT National Girls Higher Secondary School, Triplicane by Shri R Sekar, IPS, (the then) Commissioner of Police, Greater Chennai. We have nicely moved along having completed 8 successful years. All our students are from the lower echelons of society and some of them are first generation students with no support in the family. Many do not have conducive atmosphere at home, nor the proper support – still they strive to achieve is what is most heartening. Life often is a struggle for have-nots and there are many who have to struggle for even ordinary things. We try to learn from our experiences trying to iron-out the rough edges. 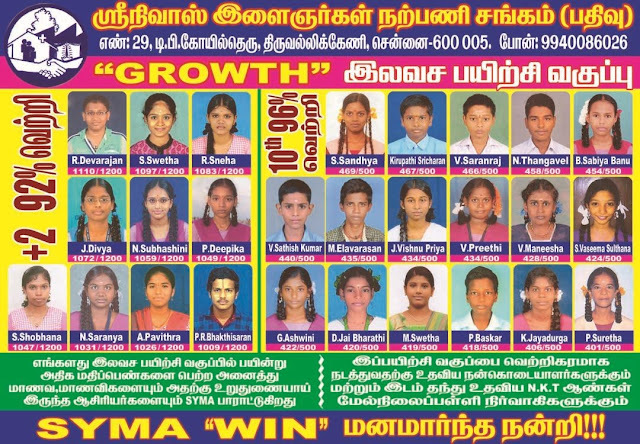 At SYMA Growth, last year, we had : X Std Tamil Medium; X Std English Medium(2 sections); +2 Commerce Group and +2 Science Group. We are always concerned about the performance of SYMA Growth students who come from lower echelons of society. This year in +2 Section : In Commerce section, out of 29, we had a cent percent pass. 8 of our students have obtained more than 1000 marks [83.3%]. 2 of Science students got more than 1000. Growth topper is R Devarajan with 1110 marks. In the Science, there is a slight set-back as 4 out of 27 failed. The X results were announced on 25th. Our students have done well. In X English medium 50 have passed out of 52. 15 students have secured more than 400 marks. In Tamil medium, which generally is marked by absenteeism at school level too, 19 passed out of 22; two of them secured more than 400. Growth topper is Ms Sandhiya who got 469/500; in Tamil medium – it is V. Saranraj 466/500 including 100 in Social Science. Meantime, the activities for the Educational year 2016-17 have commenced. This year we have a Corporate sponsor – M/s Manpower Group. We distributed applications, scrutinized them, have conducted personal interview on 15th May 2016 to +2 students. We have infact addressed the parents of aspirants in group emphasizing the standards of tuition, need for adherence to discipline, involvement of parents, attendance of students and all other aspects. We are keen on raising the level of education and making our students better informed and become responsible citizens of the society. The selection is primarily on economic criteria. Those with parental income of Rs.20000/- and above are not considered. It would be of interest to you to know that the selection was done on certain additional parameters : physically challenged, students of schools of lower fee structure, parents illiterate, parental occupation being manual labour / coolie and the like, orphans, children of destitute / single mother – all accorded some additional mark enabling that we select students who otherwise do not have access to quality tuition by paying fees. Every year at the time of inauguration, as a carrot for improved performance in studies, we tell our ‘SYMA Growth’ tuition centre students that we would print posters with photos of all students who score more than 400 out of 500 in X and more than 1000 out of 1200 in +2. This year 27 of them have their photos and achievements printed and displayed in all streets and bylanes of Triplicane. This is a grand achievement by our students considering the fact that most come from economically poor family, have none to guide them at home and the environ at home is not so conducive. We appreciate all those who have performed well and wish that they study well further and march towards a chosen successful career path. Here is the poster that would spring up in Triplicane tomorrow hailing our students………. No words can describe our gratitude to the management of NK Thirumalachariar Educational Trust and NKT Boys Higher School. We thank the NKT Management for providing us the infrastructure and all the support. We thank Smt. Leela Sekhar, Secreatry of NKT Trust and the Head master of the School Mr S Venkatadri. We pray to Almighty for continued success of this project and look forward to continued support of you all. The success is due to the blessings of Lord Parthasarathi who guides us in all our steps. We must place on record our thanks and gratitude to those teachers who taught these students with great dedication, commitment and devotion. We thank all our teachers for their care and attendance. Our Coordinator Mrs Thara and the team who assisted her also deserve special appreciation. . A Big Thank you to all of you who have been supporting us in all our endeavours.Together We will strive to make the society better place for all of us.